Protecting soil, water, and living things is the goal of the guiding Conservation Strategy document which was created by a diverse group of people, from all walks of life, from the watershed community. Monitoring was one of the actions the community asked Ausable Bayfield Conservation to continue. Visit our Conservation Strategy page. Since 2002, the Ausable River Recovery Team (ARRT) and Ausable Bayfield Conservation have been researching and monitoring the species at risk in the Ausable River. Find out more about this important work please see below. Sampling for fishes (2004, 2007) and mussels (2006) in the Ausable River watershed, as well as an aquatic habitat inventory in 2005, has provided a better understanding of Species at Risk (SAR) presence and abundance in relation to available habitat throughout the watershed. However, critical habitat has yet to be identified. The overall objective of this study is to identify critical habitat for all Endangered and Threatened fishes and mussels in the Ausable River - using an ecosystem approach. Part of this study will help to fill gaps in sampling data - particularly for Snuffbox in the lower river and Black Redhorse in the upper watershed (Black Redhorse were detected at two sites within the Ausable River main channel for the first time in 2007). The Ausable River Recovery Team (ARRT) believes that the identification of critical habitat is an important next step in advancing the Ausable River recovery program and will make a concrete contribution to species recovery. Recent sampling efforts for fishes throughout the watershed have provided a better understanding of the distributions of some SAR, while others remain largely unknown. The main objectives of this project were to: define the current distribution and abundance of Black Redhorse in the Ausable River, determine if the Eastern Sand Darter is extant in the Ausable River, define the current distribution and abundance of Pugnose Shiner and Lake Chubsucker within L Lake (historic oxbow of the Ausable River, similar to Old Ausable Channel), and summarize the differences in habitat characteristics of occupied and unoccupied sites for each of the SAR fishes. Project members surveyed the threatened or endangered fish using targeted, species-specific sampling methods. The Old Ausable Channel, near Grand Bend Ontario, is a unique feature in the southern Ontario landscape. 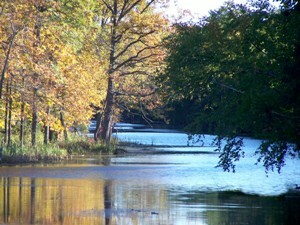 It is a disconnected portion of the Ausable River, and is recognized as an ecosystem gem. It provides essential habitat for many species at risk, including three fishes: pugnose shiner; lake chubsucker; and grass pickerel. The watershed is also home to many other rare and interesting flora and fauna: including a globally significant oak savanna ecosystem on its shores. The watershed contains a human residential area, with approximately 700 homes, just south of Grand Bend. In 2006, the Grand Bend community and the Ausable Bayfield Conservation Authority embarked on a planning process to develop a long-term management strategy for the Old Ausable Channel. This management plan completed for the Old Ausable Channel watershed documents the current status of the physical, biological and economic characteristics of this area. The management plan outlines approaches designed to protect and enhance the Old Ausable Channel for the following components: hydrology; attributes of succession; water quality; aquatic and terrestrial flora and fauna; tourism; recreation; and land use and development. Visit the Friends of the Old Ausable Channel website to learn more and view the management plan. 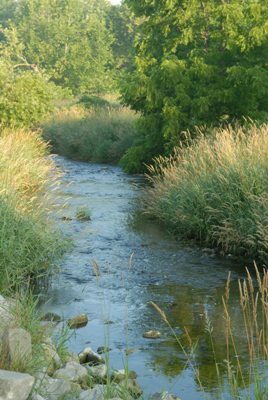 In 2005, the ARRT developed an Aquatic Ecosystem Recovery Strategy. 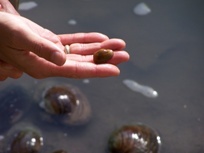 This report highlights a freshwater mussel monitoring program, a program that has been a main priority for the ARRT since its inception in 2002. In 2006, abundance, distribution, population demographic, and habitat requirements for freshwater mussels were collected at seven locations in the Ausable River. The 2006 monitoring survey found 3043 live mussels, from 23 species. Overall, the freshwater mussel community in the Ausable River was dominated by four common species which represented approximately 75 per cent of the relative abundance. Representatives of the six Species at Risk (SAR) mussels: Northern Riffleshell, Snuffbox, Wavy-rayed Lampmussel, Kidneyshell, Mapleleaf, and Rainbow were found throughout the Ausable River, with a site near Ailsa Craig having the greatest abundance of SAR and also having the greatest abundance of mussels and the highest species diversity score. Data collected during this monitoring program will help the ARRT identify critical habitat for mussel SAR, direct recovery actions where they are needed, and track the mussel species' response to these actions. In the summer and fall of 2005, ABCA staff conducted habitat assessments within the high priority zone where endangered and threatened fishes and mussels have been found in the Ausable River watershed. Habitat assessments were carried out in the Ausable River for a consecutive stretch starting near Exeter and finishing at the Ausable River Cut. Habitat assessments were also conducted on the Little Ausable River, a tributary of the Ausable River, starting near the village of Clandeboye and continuing downstream to the mouth of the Little Ausable. Habitat characteristics, such as river morphology, substrate type and turbidity were documented. Habitat characterization and assessment helped to identify the areas in the river that meet the general requirements of the six target species at risk. Data collected from this assessment highlighted previously un-sampled areas with the appropriate conditions for the six target SAR. This project will help to identify critical habitat for Ausable River SAR. This survey was conducted during the summer and fall of 2004 and examined the fish communities and in-stream habitat characteristics of the Ausable River. Fisheries information was collected using seining, backpack and boat electrofishing. Habitat characteristics, including total suspended solids and substrate particle size, and were surveyed to complement the fisheries information. These surveys were intended to identify habitat variables that affect fish community structure and to locate four Ausable River species at risk, including the Black Redhorse, River Redhorse, Eastern Sand Darter, and Greenside Darter. Click here to download this report in PDF format and learn more about the fisheries survey! COSEWIC-listed species. Recommendations focused on four main areas: research and monitoring, stewardship/ habitat improvement, management, and public awareness. by several SAR within the watershed and will benefit the aquatic community in general. The Recovery Strategy is organized in three parts: 1) goals and approaches for overall ecosystem recovery, 2) goals and approaches for the three taxa groups (mussels, fishes and reptiles) and 3) species-specific information summaries for each of the 14 COSEWIC-listed species. include: improve water and aquatic habitat quality through actions that mitigate identified threats to species at risk, establish a monitoring program to assess trends in the aquatic community and in the environment in order to determine change over time, and clarify and assess the relative significance of identified threats and recommend appropriate mitigation measures. Click here to download this report in PDF format.